Project Description: This project involves extending the I-395 Express Lanes an additional 8 miles, from Turkeycock Run near Edsall Road to the vicinity of Eads Street in Arlington, Virginia. The two existing I-395 HOV lanes are being converted to Express lanes, and a third lane is being added, providing three reversible Express lanes. The Express lanes are free for use by vehicles with three or more occupants. Vehicles with less than three occupants are permitted to use the lanes by paying a variable toll. Tolling is priced based on congestion levels. T3 support this effort by collecting traffic count data at selected locations within areas impacted by construction and then evaluating traffic patterns to identify the peak time periods to analyze for worst case conditions. T3 helped develop traffic volumes across the roadway network and then analyzed expected traffic operations during construction using Synchro software and Highway Capacity Software (HCS). To readily show traffic results to the public in a friendlier graphic format, T3 prepared figures and maps using ArcGIS Geographic Information System (GIS) software. Description of Project: VDOT issued a design-build request for proposal (RFP) on September 24, 2013 (and Addendum No. 1 on December 20, 2013) to reconstruct the I-66/US Route 15 interchange, including adding auxiliary lanes in the vicinity of the I-66/US Route 15 interchange on US Route 15 (James Madison Highway), VA Route 55 (John Marshall Highway/Washington Street), construction of a new service road, and replacement of northbound and southbound bridges carrying US Route 15 traffic over I-66 with a single bridge. 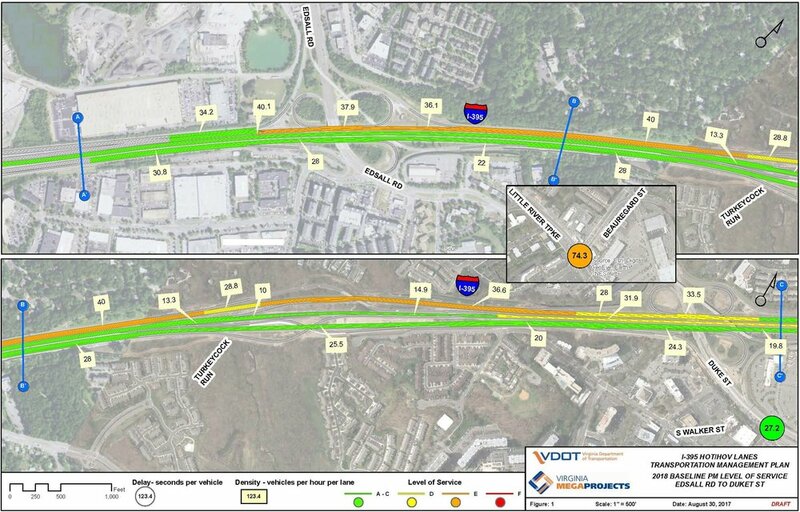 T3D’s Role in Project: T3 is part of the design-build (D-B) team that proposed a diverging-diamond interchange (DDI) concept on U.S. 15 at Interstate 66 as an alternative concept in response to VDOT’s initial design-build RFP. As part of the D-B team’s response to the RFP, T3 conducted an initial analysis that demonstrated that the DDI, which shifts vehicles to the opposite side of the road and eliminates left turns that cross oncoming traffic thus improving safety, was feasible. 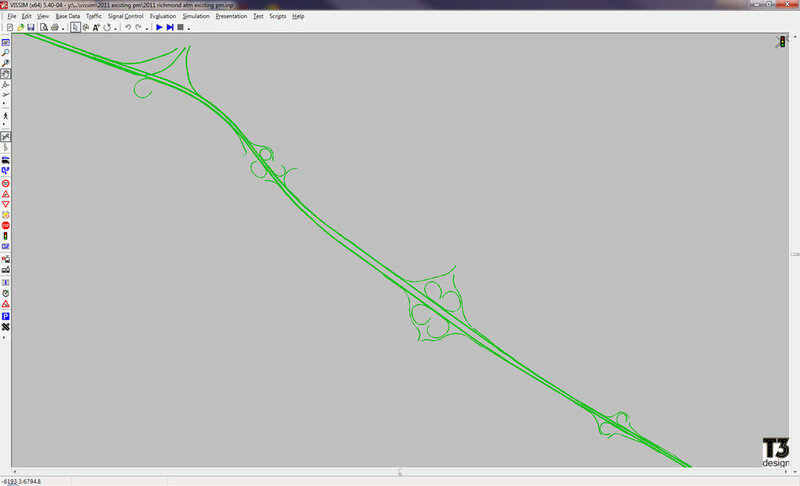 Traffic Analysis: T3 is preparing an update to the traffic analysis for the project using VISSIM modeling software. All traffic modeling will adhere to VDOT and FHWA requirements and will be used to validate that the DDI concept operates at an “equal or better” level than the original proposed alternative. IMR Update: T3 is preparing a supplement to the previously approved VDOT Interchange Modification Report (IMR), analyzing the now-preferred DDI alternative. The supplement details operational and safety benefits of the DDI design. T3 is participating in coordination meetings with VDOT and FHWA to gain final approval of the IMR update. Traffic Signals: T3 Design is preparing traffic signal plans for full signal construction or modification of existing signal equipment to accommodate the DDI and modifications at the following adjacent signalized intersections: Route 15 at Heathcote Boulevard; Route 15 DDI crossover at I-66 off-ramps D2 and A2; and Route 15 at Route 55 (John Marshall Highway/‌Washington Street). These traffic signal plans will include foundations, traffic signal poles, signal heads, conduit system, junction boxes, circuitry, video detection devices, emergency preemption, signal cabinets, control equipment, uninterruptable power supply (UPS), terminus lighting, signal interconnect conduit and wiring, and signal-related signing. Temporary Traffic Signals: T3 is preparing temporary traffic signal plans for the four signalized intersections to provide traffic control as needed during each phase of construction. Temporary signal requirements will be coordinated with the traffic control plans to achieve the established project construction sequence. Transportation Management Plan (TMP): T3 is assisting in development of a TMP, which will document the sequence of construction to show how traffic will be managed during each of the multiple construction phases. Work Zone Traffic Analyses: T3 is preparing a work zone traffic analysis as necessary to support the temporary traffic control plans and includes work zone speed analyses necessary to support speed reduction requests by the design-builder. Traffic Operations Strategies: T3 is preparing transportation operation strategies including incident management plans. Project Description: The Virginia Department of Transportation in cooperation with Frederick County has conducted a study of alternative improvements to the proposed extension of VA Route 37 Bypass with proposed interchanges at Warrior Drive and US 522. The extension of VA Route 37 east of I-81 to US 522, and beyond, has been in the planning process for over 20 years. In recent years, the project has evolved to the Interchange Justification Report (IJR) stage by the prompting of a Tri-party agreement in 2012 between VDOT, Frederick County, and the Crosspoint developer Glaize Developments, Inc. Crosspoint encompasses nearly the entire length of the proposed VA Route 37 extension to US 522. The preferred alternative improvement selected by the study provides flexibility in order to serve an uncertain future based largely on future development. T3D’s Role in Project: T3 is developing an Interchange Justification Report (IJR) for two proposed interchanges to be located on new alignment on the Route 37 Bypass south of Winchester, Virginia. The two proposed interchanges are to be located at Warrior Drive, which is to be extended on new alignment up to the proposed Route 37 alignment, and an additional interchange at Route 522 (Front Royal Pike). The detailed T3 work include the followings. Traffic volume projections, in coordination with MPO travel demand models and other studies done for the project and for adjacent private development. Preparation and calibration of CORSIM models for the weekday AM and PM peak travel hours. Complete a safety analysis based on AASHTO’s Highway Safety Manual methodologies. HCM and CORSIM analyses for Existing Conditions and design alternatives for build and no-build conditions for the opening year and the design year. Develop the operational analyses required to support the IMR and document final recommendations for changes to improve both operations and safety. Analysis of alternative travel modes for the area, including bus and train routes. Complete freeway, weave, and ramp junction analyses to identify and quantify potential upstream and downstream traffic impacts. Complete a conceptual signing plan for advance guide signs on the new bypass facility and proposed exits. A preliminary traffic control device plan for the preferred alternative that may include lighting and signals at the interchange ramps, and a construction cost estimate. Prepare materials and simulations for public involvement and attend stakeholder and citizen information meetings, as well as a design charrette. Coordinated improvements at the western end of this project at I-81 Interchange 310, where the proposed bypass will terminate at a separate interchange improvement project and the Crosspointe Development. Description of Project: Planning study to identify mid-term mitigation measures to improve safety and reduce congestion on the interstate system in the greater Richmond area. Measures may include reconstruction of ramps, addition of auxiliary lanes, improvements to or addition of acceleration/deceleration lanes, ramp metering, CCTV, lane control, or other advance transportation management system improvements. T3D’s Role in Project: Prepare traffic forecast. Provide base VISSIM micro-simulation model, GIS mapping and cost/benefit of recommended mitigation measures for the following study limits. I-195, from I-64 to I-95. Project Description: To facilitate the Interchange Modification Report for the Seminary Road interchange at I-395, crash history and trend are to be collected and studied for the area including from two immediate interchanges at VA Route 7 and Duke Street on I-395. The crash analysis can identify the hot spot and hazardous locations, which to be alleviated or addressed by the interchange design. T3D’s Role in Project: Collect historical crash data, including crash time, crash type, crash location, crash frequency. Analyze crash data by type and frequency on segments along I-395 between VA Route 7 and Duke Street and identify problematic areas and cause. Graphically present the crash data using ArcGIS software.